DEARBORN, Mich. Ford Motor (F) will pay $750 million in separation benefits to hourly workers at a Belgian factory it plans to close next year. Ford revealed the cost in a government filing Tuesday. 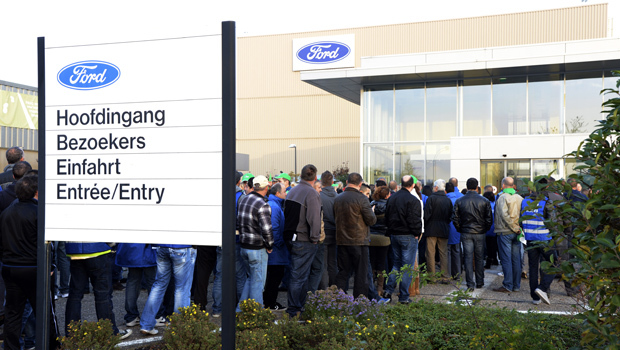 Ford employs 4,000 hourly workers at the Genk plant. Most approved the separation plan last week. Payments will vary based on age and seniority. Workers 50 or younger will get up to two-and-a-half years of pay. Those 52 or older will get a bridging pension until they reach 65. Ford also promised to repay a 2.5-percent wage reduction workers agreed to in 2010. Ford, based in Dearborn, Mich., is closing the Genk plant and others to deal with overproduction and low sales in Europe. The company has warned that the restructuring will cost $2 billion this year.